Convert MXF to MP4, MXF to MOV, MXF to WMV, MXF to AVI, MXF to MPEG, etc. 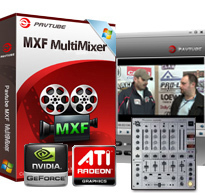 Pavtube MXF MultiMixer is a wonderful MXF multi audio track/ channel preserver, mixer and converter. It helps not only import and export MXF files with the multiple audio tracks/channels, but also helps mix the multiple audio tracks/channels into one. Other than that, it helps convert the MXF files into any other formats for future editing in Avid Media Composer, Sony Vegas, Adobe Premiere, playback on iDevices like iPad, iPhone, Apple TV, etc, Android devices like Samsung Galaxy Tab, Google Nexus 4/7/10, Kindle Fire HD, etc, Windows devices like Microsoft Surface Windows RT/Pro, etc, HD Media Players like WDTV and more. With this smart MXF tool, you can easily handle MXF files from Sony XAVC cameras, Canon XF camcorders, as well as Panasonic P2 camcorders. For MXF videos from Panasonic P2 card, you can directly import the MXF video and the audios (either multi-track or not) will be automatically detected and imported to match the MXF video. MXF MultiMixer supports import multi-track MXF and under the Multi-track Video format category, you can output MKV/MP4/MOV formats with multi audio track and channels for broadcasting, further editing, and playing. Before exporting multi-track format videos, you can choose to mix the MXF multi track/channel audio into one or keep the multi tracks. Mixing the multi tracks/ channels, you can get audios of the interviewer and the interviewee into one mixed audio. It's easy for you to make MXF format to editable footage for your editing software, all you need to do is to figure out what format the editing software requires and convert the MXF into that format. It has preset format options for Avid Media Composer, Adobe Premiere, and Sony Vegas. MXF MultiMixer is also a powerful MXF converter which helps convert MXF into any other formats for playback in popular iOS/Android/Windows tablets and phones, HD Media Players, and more. Q:I have ever purchased your Windows software and now I changed my PC to Mac. Can I install this software onto my Mac? Or can you send me a Mac version?